Here's what happened when Logitech sent comedian Ben Gleib to engage CES attendees with humorous commentary on new tech. 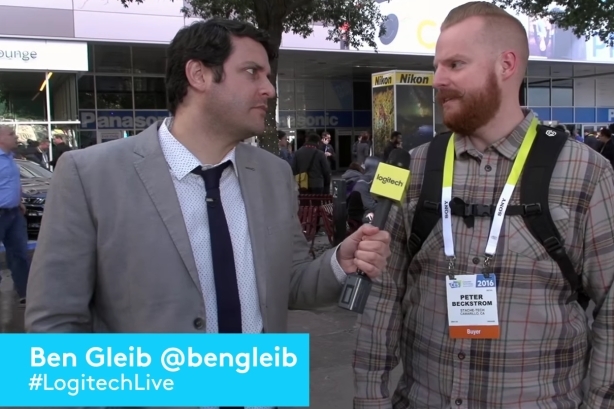 Aiming to break through the noise at the International CES 2016, Logitech produced daily videos hosted by comedian Ben Gleib, who interviewed attendees on the showroom floor. The CES event, also known as the Consumer Electronics Show, is held annually in Las Vegas, Nevada. This year, CES wrapped with record-breaking attendance of more than 170,000 people, including 50,000 coming from outside the US. The on-site component of the campaign was coupled with a Twitter promotion for CES attendees and fans at home, driven by the hashtag #LogitechLive. The overall objectives of the campaign were to create memorable experiences for consumers and garner media interest in the Logitech brand. With a smaller budget than many of the mega brands at CES, and no big product announcements to rely on, the #LogitechLive strategy focused on engaging consumers with an activation that would resonate beyond the show floor and demonstrate Logitech’s distinctive brand personality. "CES is one of the biggest and exciting tradeshows in the US," said Krista Todd, VP of global communications at Logitech. "Our goal was to break through the noise and stand out -- in a uniquely Logitech way -- without spending an exorbitant amount of money on an activation. We also wanted to create a program that would be compelling for show goers and engaging for our fans at home as well." Finn Partners, Logitech's PR agency partner in the US, worked with Praytell Strategy to develop the concept of the live show at CES. The team selected Gleib, most known for hosting the show Idiotest on the Game Show Network, to host the #LogitechLive experience. Logitech launched the campaign on January 6, with Gleib and a small production crew roaming throughout CES and conducting interviews on the fly. Gleib engaged CES attendees with humorous commentary on new tech, as well as solicited responses about made-up tech products and other tech rumors. The production team uploaded the footage to a cloud server several times each day so the editing crew could create videos in real time. During CES, roughly five short videos appeared each day on Logitech’s social media channels and a dedicated microsite. In addition, Logitech's social media followers were encouraged to submit their own tech questions for Gleib and retweet Logitech’s content from CES for a chance to win a Logitech prize pack. "Adding a sweepstakes element helped us engage with fans at home," explained Todd. "There are hundreds of thousands of attendees each year at CES, but so many more consumer tech enthusiasts who can't make the show. We wanted to include those people in the same kind of fun we were having on the ground in Las Vegas; adding a sweepstakes element allowed us do that." She added that this campaign is "proof" that no matter the size of your budget, you can still lead CES chatter by using social media and a clever approach. The PR team also shared the campaign with several media outlets, so they could follow #LogitechLive during the event. For the overall Facebook and Twitter impact, Logitech secured over 41 million combined social impressions, as well as 22,400 social media engagements. At the event, real-time data and content company Buzz Radar hosted the CES Social Media Command Center’s "big board," showcasing live feeds of the most trending brands, hashtags, and CES topics to attendees. From Wednesday through Saturday the week of CES, @Logitech, #LogitechLive, and @BenGleib all made trending appearances on the board. The #LogitechLive sweepstakes received more than 24,300 entries.